Two dozen students at Lanigan Elementary School were recently honored for identifying with other people’s concerns. Lanigan Elementary December role models show off their certificates, presented to them by Principal Jeff Hendrickson, top left, during a recent assembly. Absent from photo is Taylor Jodway. 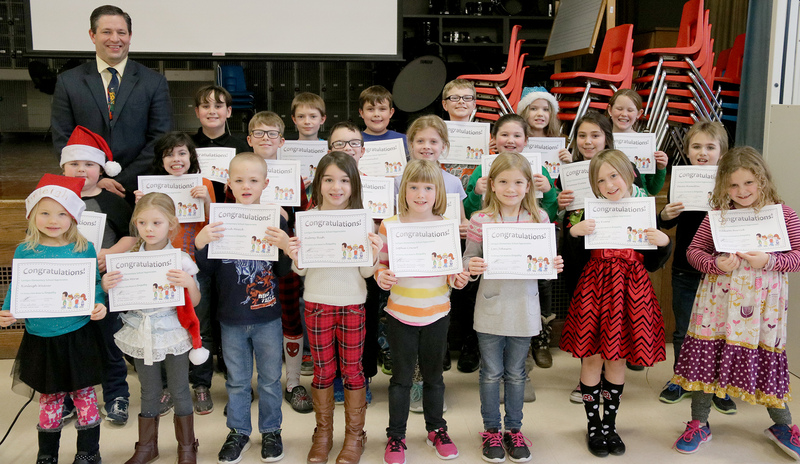 Principal Jeff Hendrickson congratulated each Virtue of the Month recipient and thanked them for showing empathy in their classroom and the school hallways. Each teacher honored one student from their classroom because the children exhibited sincerity to friends, defended others, were concerned about the wellbeing of others, offered hugs or encouragement and genuinely listened to others. Empathy award winners include: Taylor Jodway, Jordyn Moon, Samantha Moon, Mason Fuller, Owen Dumouchel, Colin Moon, Jacob Atwater, Isriella Towle, Devon Hamilton, Arianna Dumas, Shyanne Burnswick, Kiley Pudney, Liam Green, Abe Gallagher, Addison Barrick, Avery Evans, Lori Johnson, Emma Liberti, Sophia Cowart, Aubrey Bush, Heindrich Mesick, Isabella Morse, Kinleigh Weaver and James Clark, Jr.
Also recognized were students Evan Philbin and Kimora Wilson who received an “On a Roll” award for working hard and making good choices throughout the month of December. Principal Hendrickson offered congratulations to several Lanigan Eagles who received golden tickets because they obtained a “satisfactory” or “exceeding” remark regarding the school’s expectations on their first report card for the school year. He encouraged the entire student body to set goals so they, too, may earn a golden ticket by the end of this quarter.